Fixed my hand brake. What a poxy job. The small threaded part that connects to the rear cable had snapped. Its all tucked up above the diff but just accessible with the prop and exhaust removed. I managed to make use of the bit of thread left and re-attach it. Still waiting to pick the exhaust manifold up from being ceramic coated but should be finished tomorrow so the plan is to get the car back together and running tomorrow night. Bought another 240z project car. Pics, cause Mike wants pics dam it. painted my engine bay light and put a new switch in it. Took out the gear lever to diagnose a rattle at speed and discovered that there are no bushings - so need to order new ones for that. Changed round some wiring for the power steering - fixing the control box to the firewall (anyone know if the stock insulation on the firewall contains asbestos??) but rounded one of the screws so need to replace that tomorrow. Fixed the horn as the relay in the passenger footwell wasn't working or so I thought - turns out it was the clock switch lever that had come loose. Refittted the front valance and got the front grill and bumper brackets back from the powder coaters and popped them in. Painted my head light surrounds and epoxied one that was broken. Finally she goes to the paint shop on Monday (3 weeks later than planned) for the fender holes welding closed and painting and a small amount of rot fixing as well. 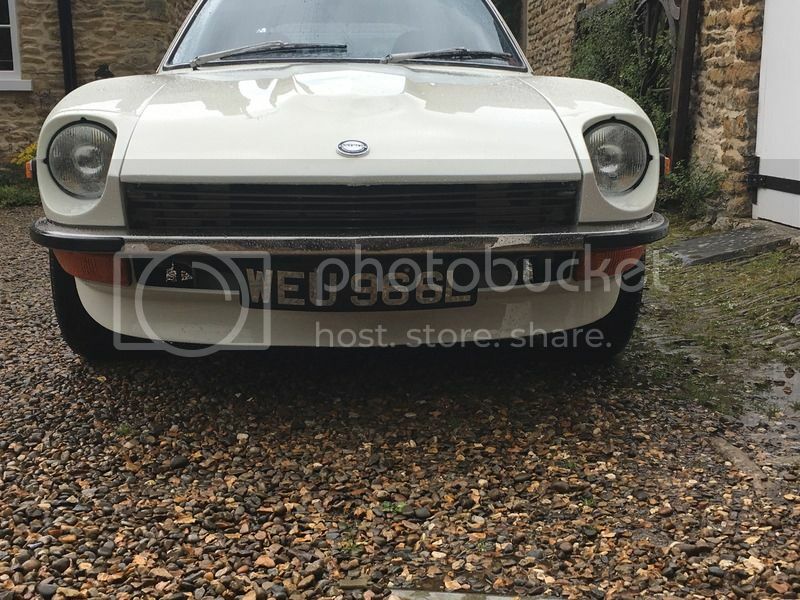 Just waiting on the bumper back from the chromers now, although I am having trouble sourcing replacement rubbers, so might have the holes filled and chromed over. Passed the MoT on thursday. Spent nearly all of Saturday finally removing the 90s clarion headunit and then battling to extract the heater console ... those darned cable connections! Learned that I actually don't know for certain that my heater isn't working because the connecting pin at the rear that links the heater v vent cable selectors is gone. So the control lever wasn't doing anything. And replaced that old heater console that had been cut for the radio cage and was broken along the bottom with a nice clean one I picked up at IONAs. Blanking attached to cover the vacant radio bay - cubby hole construct to follow. Sprayed up the clasps and fixing plates on my luggage straps, and pottered around the engine bay for a bit of spring cleaning. And removed, cleaned and secured a front indicator the was flapping free at one side, the screw hole had rusted through. JK, when the weather is good in the Lakes it's wonderful. I know the road you're talking about - it splits into two at times. Jennings beer is wonderful too, think Cocker Hoop is my favourite. I've been getting my blue car ready for Donington, good weather here so I can work on - no room in the garage. Not finished yet - I need a few more dry days. Amongst other things I've been fixing the dash lighting - what a bar-steward. All instruments now lit. Needs an MoT this week - it's been off the road for nearly 3 years. JK would have liked to have made Dalemain to see your car but wife had other plans. Called in to Keswick on Saturday to check progress at Greta Bodyworks, currently undergoing final panel fit/alignment and final paint. Getting there, but getting good panel alighments is taking longer than anticipated, still it has to be right before the paint goes on. My favorite beer. Like that pub too of an evening. Just realised the blue car MOT had run out so a quick to the MOT station was in order this morning. All legal again now. Replaced faulty fuel pressure gauge under the bonnet. Took the car to the carb guy and let him tweak things. Cleaned & polished. Filled up with fuel, drove till it was 3/4's empty and filled up again. Cleaned again. Went to a classic car & bike meet of around 120 vehicles. Tomorrows job - replace the last section of fuel line under the bonnet (still hasn't be done) and find out what the new rattle is and fix. Then a general check over ready for Donington. Had the same problem on mine last year. Snapped during the MOT so not-surprisingly it failed on the lack of handbrake. I ended up using a length of threaded stud bar with a nut welded on one end where it sits inside the bracket at the front to stop it pulling through. I gave it a bit of extra length to increase the adjustment and all is now well. Spent all day Saturday fitting & trying to tune a set of 'new' 1 3/4 inch SU carbs but ended up concluding they were shot and putting some 1 1/2 inch SUs off my 2.0L engine back on. Now got it running sweet & even sorted my water system issues. Took it for a first run since the engine swap to an L26. Did around 30 miles around the Castle Combe/Chippenham area with no problems. Gearbox refitted after overhaul, oil and filter change, engine splash pan fitted. Gearbox is excellent, selects all gears nicely ( no crunchy second, yay!) and is now as quiet as a church mouse when sat in neutral, clutch not engaged. The newly fitted spoiler looks good, although it needed a lot of work to make it fit for purpose and some bracketery fabricating to stiffen it up a bit. All in all a very expensive but ultimately successful seven days. Looked at it a bit, looked at it some more. Love it, did the same this week! Checked carbs on choke yesterday and took for 4hr drive. Passed my first 1k in the car. yaye! Took delivery of a Rupes Bigfoot Mini today. Spent the past 3 weeks debating on DA Polishers and researching paint correction, polishing and glazing. Settled on the Rupes, over Flex and DAS. 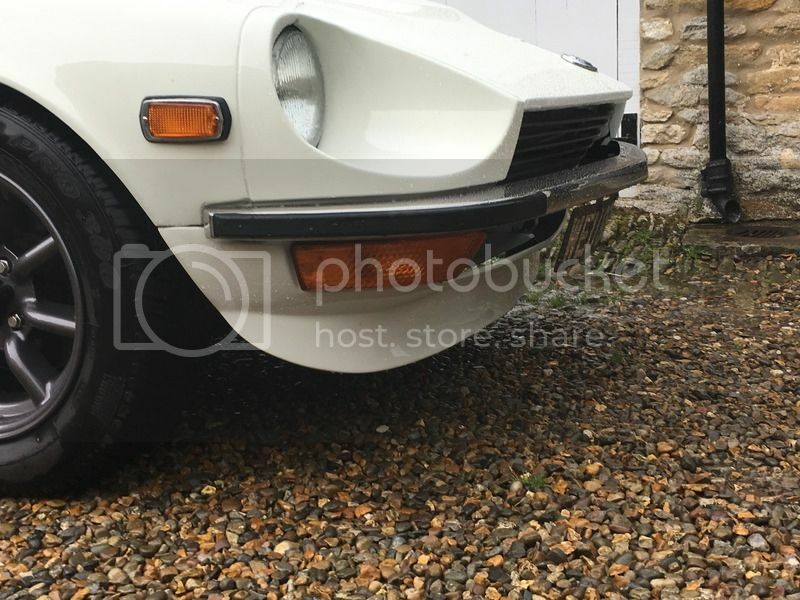 Joined detailingworld.co.uk, absolutely fantastic site with lots of info and people willing to help. Brilliant!